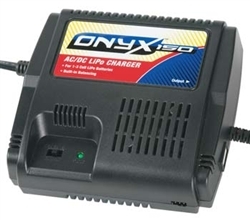 This is the Duratrax Onyx 150 AC/DC Balancing LiPo Charger. All errors are displayed by an orange LED. See the error code reference chart located in the instruction manual. Once the Onyx 150 has finished charging, the red LED will flash repeatedly in conjunction with audible tones. After the flashes and tones stop, the red LED will continue to flash once for each cell connected.